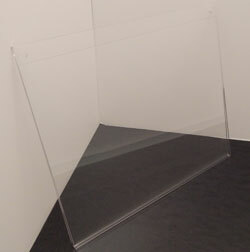 This is an acrylic sign holder (vertical). You can use these acrylic sign holders to provide your customers with important or relevant information in an non-intrusive manner. Our acrylic signholder features flame polished edges to give a clean and professional finish. With a one-piece construction durability is not an issue and it allows you to easily change out the information stored in the signholder. This sign holder is a wall mount design which makes it easy to display in almost any location within your retail space. This signholder is constructed of clear acrylic that is twice as thick as economy versions of this sign holder.